Most of us begin our lives with white teeth, but they tend to become dull and dingy over time. At Exceptional Dentistry, we conveniently offer the in-office Zoom!2™ Tooth Whitening System to help you regain a brighter, younger-looking smile. Our before and after Teeth Whitening photo gallery for patients in our office can be viewed here. 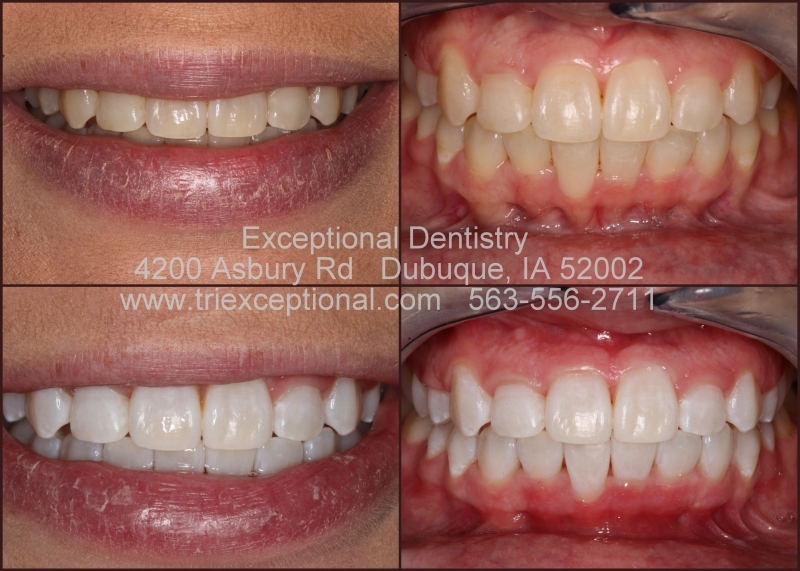 Learn about this innovative solution for whiter teeth by calling Exceptional Dentistry in Dubuque, Iowa, today at 563-556-2711. Some people naturally have whiter teeth than others. The aging process can also dull and discolor teeth. Drinking coffee, tea and wine, smoking cigarettes, and eating strongly pigmented foods like berries can stain teeth. Tooth trauma can affect the color, as can old metal fillings that start to show through the thinning enamel. In childhood, tetracycline antibiotics will affect color as the teeth develop and this is deeper staining than what is caused by foods. Poor at-home brushing and flossing can also affect teeth whiteness and brightness. The truth is that no one has stark white teeth. All teeth vary in shades of white, cream and yellow and over-whitening the teeth can make the smile appear "fake". Zoom whitening is ideal for anyone seeking immediate results. Typically, your teeth will appear at least six to eight shades whiter. The Zoom Teeth Whitening System safely and effectively whitens teeth in about one hour of whitening time. We ask patients to allow 2 hours total for their visit due to the additional steps in the appointment. The procedure begins with a preparation to protect the lips and gums. A special whitening gel is applied to the teeth, then activated by the Zoom light to enhance the whitening effect. In the majority of cases, four 15-minute whitening sessions are completed. Before and after photos are taken for the record, and post op instructions are given. There are usually 3 total visits for the Zoom process that include: 1) impressions, 2 ) Zoom Whitening, 3) final shade check a few days later. A patient will also take home custom whitening trays that can be used for future at-home use. The convenience and results of this procedure are often dramatic. To maintain your beautiful, white smile over time, Exceptional Dentistry offers custom whitening trays and bleaching gel for future touch-up use in your home. To create your whitening trays, we make custom molds of your teeth, so that the trays fit your teeth specifically. Whenever you decide your teeth need a brightening boost, you can fill your custom-fitted trays with a prescription-quality whitening gel, and whiten your teeth at home. The trays are a very effective way to maintain the results of your in-office Zoom whitening, and the results are long-lasting. After bleaching, no special maintenance of your teeth beyond regular brushing and flossing is required. But keep in mind that daily consumption of pigmented foods and drinks will gradually re-stain your teeth. Professional cleaning can remove much of it. So don’t forget to schedule regular checkups with Dr. Ted Murray, Dr. Kristen Berning, or Dr. Alexia Oetken every six months to keep your smile looking its best. Please call Exceptional Dentistry at 563-556-2711 to schedule an appointment for Zoom tooth whitening. 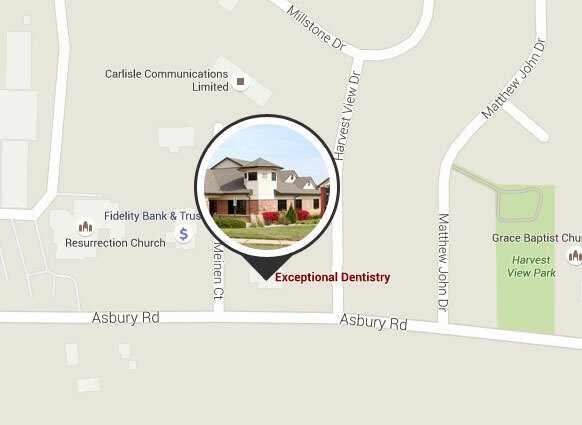 Exceptional Dentistry serves Dubuque, Peosta, Dyersville and Davenport, Iowa, as well as Galena, Illinois.